The Laughing Gulls: Are People Hearing What You Are Saying? My summer included a visit to the shore and, one morning, a serene paddle on a salt-water pond where a naturalist taught us about coastal animals, mainly seabirds. Because its call sounds like it is laughing. You’ve likely heard a laughing gull before. It has a high-pitched, repetitive, cackling caw. Maybe you’ve wondered… what is it laughing at? You, in your slightly stretched-out bathing suit and funky humidity hair? Of course, it’s not actually laughing at you in your bathing suit or for any other reason. It just sounds like it is laughing, no matter what it might be saying. But what if it is saying something that isn’t light-hearted or humorous? You know, what if its laughter is actually a plea for help or a warning call to other birds? But instead of those phrases, all anyone hears is just… laughing. In what ways are you like a laughing gull? Are you being clear in your communication? If what you’re saying is important but is only expressed as your laughing gull, what’s the impact of not being heard? 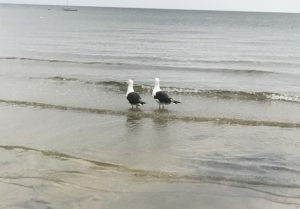 We’re not birds who live at the beach (although someday I’d like to fly away to my own beach cottage), so how do we mistakenly become laughing gulls in our busy lives at work and at home, with family and friends? By saying we’re “fine” when we are anything but. By insisting “nothing” is wrong even when we know things aren’t right. By agreeing to that last-minute request to work late — oh no, it’s no problem at all, you can count on me to come through and work comes first no matter the upheaval to my personal life. I’m just fortunate to be here. How else do we do this? Our laughing gulls are all the times we’re afraid to speak up for ourselves. When we struggle to find the right words… When we downplay our achievements so that we won’t come off like we’re bragging. Stop holding back on what you truly want to say. Stop assuming that the louder gull who always flies in front has all the answers. Stop getting into formation, swallowing your concerns just to go along with group consensus. You have something to say. Say it. What’s so funny, laughing gulls? And make sure you’re hearing me. Because this is no laughing matter. How we communicate is how we connect. You want to spread your wings and soar? Make sure what you say is being heard. And if you’re flying in a flock that drowns you out or refuses to listen, it’s time to find a new one. Want more articles like this? Read and share: Take Off Your Mask, Make a Splash and Keepin’ It Real: Don’t Be a Robot.